If you've always wanted to play the guitar, this is where your journey begins. 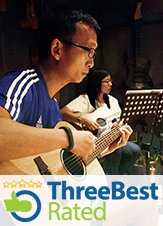 This essential module offers you a genuine opportunity to speedily pick up guitar-playing aptitude. Right from the first class, you will be taught how to play a song. By the end of this 7-week module, you would have played more than 20 songs. I have been trying to learn the guitar for many years without success. But since joining Believer Music, the structured modules has made it easy to pick up. What I enjoy most about the lessons are the grounded Christian teachings and not just the practical side of playing. It almost feels like a cell group coming together to learn about God and play the guitar. Highly recommended! I always thought that learning a musical instrument required gifted talent born from the beginning. However, I decided to take a step of faith and signed up for the Guitar Beginner program. Surprisingly, it was very manageable. The Coach teaches very well and he is very patient as well. In a group class setting, you get to learn more as a group compared to a 1 to 1 class. The group environment makes the learning more interesting and effective. In addition, the Christian element to the sessions every time just makes it more meaningful and interesting! Get to learn new things all the time! I have no musical background and this is my first time playing the guitar. However, I found it very useful and I have also gained more confidence after the first lesson. I will definitely recommend it to my friends. Many years back, God gave me a dream – I was standing in front of a crowd of 30,000 at the Indoor Stadium praising and worshiping God with the guitar. At that moment, I thought it was quite impossible to achieve because I did not have any musical background. Hence, I did not pursue this dream. A week later, I shared this dream with one of my worship leaders. She mentioned that she had a similar dream which led her to where she is now - leading worship. She encouraged me to take up guitar lessons. I also met up with another sister-in-Christ who offered to pray for me after our conversation. It was during the prayer that my dream flashed across my mind once again. I had a friend who was teaching guitar and I approached him to guide me. However, I realized that I didn't manage to learn much. I felt demoralized and decided to give up. Many years passed and I still very much wanted to learn but perhaps with that bad experience, I dared not continue. This year, one of my worship leaders asked me if I wanted to learn drums. He was willing to teach me, but my heart was still more inclined towards the guitar. Having other commitments that were time consuming, I resulted in giving myself excuses rather than taking up lessons. 3 to 4 years ago was when I first came across Believer Music at Novena Square. As the location was too far from my house, I prayed to God. Early August this year was a turning point for me. As I was on my way to the hospital to pick my mother up, "BELIEVER MUSIC" at Tampines Plaza caught my eye. There is now a branch convenient for me! The moment I saw that I knew that I cannot hide or run anymore and so I tried to register and expressed my interest in a Monday class. However, many months passed and I was unable to be offered a suitable a timeslot. I was very disappointed. Until one day, I decided to take half day leave and walk home from the Tampines bus interchange which would pass by the training centre. It felt as if I was taking a chance to enter Believer Music again and I’m glad I did. At the counter, a staff at the reception was there to assist me and I registered on the spot! So far I have gone through 4 weeks and I love the way Believer Music conducts their lessons. It not only trains me to play as a musician but the lessons bring me deeper in knowing and loving God. My coach is a teacher that points out mistakes to us so that we can improve. He is a very encouraging coach. Although I am still not that good – sometimes I will still play wrongly when changing chords, he is always patient to teach and guide the class. He encourages me to know that I can learn to play the guitar and I can build my confidence once again. Really thank you for helping me to pursue God even more. This is my story and I hope that this will continue to help you uphold the vision and good work. Great is your reward in heaven. Amen! Throughout the Believer Guitar Program (XP Trial to WDII), I have enjoyed the teaching of the coaches. Although I'm a slow learner when there are new chords, I am really thankful that they are patient to guide me along. At every lesson I learn more about the God that created me and how much He wants to be with me. Every lesson in Believer Music brings a new experience and fresh revelation about how magnificent God is. I would encourage those that are interested in music to come and join Believer Music (through learning the various instruments), and see how God can change you in this awesome journey. I joined the Believer Music program years ago. Not only has this program given me an additional skill to play simple music, it also provides me another area to appreciate music. Most importantly, it gives me an avenue to worship God not using Youtube or playing CDs but it enables my cell group to worship freely without constraint. Thank you Believer Music! I want to thank God for bringing me into this music journey with Believer Music. It has been a fruitful learning from Foundation till WD1. The two coaches that I encountered, were full of encouragement and patience. Such a slow learner like me gradually picks up the techniques. I remembered there was once in the lesson, I couldn't get the finger style right, I wanted to give up, telling the coach to go on with the lesson without me. He told me that we shall not leave anyone behind. And he patiently taught me how and put in a way that I understand and I finally did. Thank you. I wouldn't know that at such an age, I can also pick up an instrument to play and worship God. I want to thank God and Believer Music. Wonderful mentor for the guitar. Individualized learning from each teacher. Conducted in small groups (i.e. 6-8 persons), the 1 hr per week sessions include: INTRODUCTION to the guitar and its role RHYTHM Orientation - Strumming and Style HARMONY Orientation - Chord & Progressions SONG Application and Techniques BUILT-IN Weapons - Enhanced Techniques INTERACTIVE Music Exercises (Ensemble style) WEEKLY E-Newsletters. You will learn more than strumming rhythm and chords. You will learn to take steps to worship effectively on the guitar. I received classical guitar lessons on previously. Is it still applicable in this course? It is applicable because you have learnt to listen to yourself as you play and follow general timing. Here, you will learn how to strum effectively with a variety of styles. You will be able to decide the most appropriate rhythm to use as well as play the song in more than one fashion. The course is fairly demanding and requires concentration and time-allocated practice on your own. Nevertheless, what you are going to learn here is going to be fun and practical. We make it possible for you to track whoever signs up for the course and even include a subsidy appropriation. Are you interested in equipping and mobilizing the cells under your care in regards to worship? Please contact us for an appointment. We'd like to share with you how this guitar program can mobilize your cell ministry members and raise the level of worship.